Moving Forward — Ginger writes. I have been to see my counselor five times now. I have spent a few hundred dollars and more than ten hours of time driving and sitting in sessions so far. And one thing I have gained is major respect for this guide God has given me. She is filling me with hope, giving me grace, teaching me, and challenging my ideas. She is wise, wise, wise. Moving forward is changing what exercise means and changing what it looks like. She told me she isn't trying to take it away altogether, because the point is not to make me obsess more. We want enough change to challenge me but not enough to break me. The freedom, said she, is that I'm free to move and work out, but also free not to. I told her about my three days of non-exercise last week. Yes, three days is all I could take. I was at the point of not being able to sleep by the third night because my mind and my legs felt so restless. I decided that Jesus' suffering would have to count for mine. So on the fourth day, I walked and ran. Early, alone, and fast, which are my preferred methods. On the fifth day, I got my fix again, and was starting to feel normal and a bit more easygoing. I could stop obsessing because the exercise came back. It felt as if I had no choice in the matter, to be honest. I am learning that this shows the power of addiction and what my counselor called payoff. 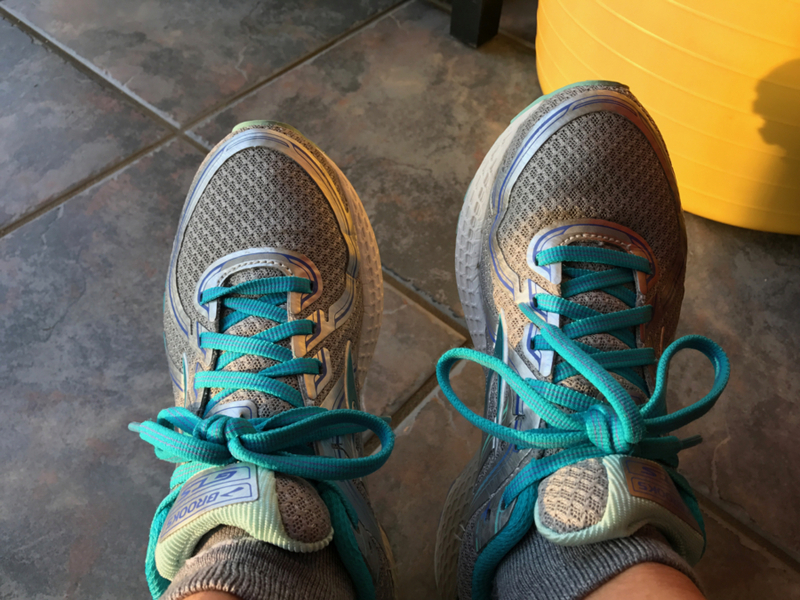 I went to my session with a looming question: Because I struggled so much to give up exercise for just three days, does that mean all the more that I must give it up to ever move past the addiction? With drug addiction, I get it: the drugs have to go. With alcohol: most likely also must go. With food and exercise, it's not as simple as that. The food and exercise pieces of addiction are complicated because they are both things that are good and that we are not supposed to go without. God made us to eat, and God made us to move. My counselor affirmed the trickiness of what I was asking and said that she is not generally in favor of taking exercise away altogether. Rather than just try to "fix" me or put me through the ringer by suggesting a task beyond my ability to endure, she used her calm voice to speak true words. If the first part of moving forward is to change what exercise means, then I must identify what it has meant. It has meant much: This is who I am. I feel lost without it. My mood is defined by it. I demand it. I believe the lie that I can't make it through the day without it. It's my idol. Second question of the day: What's an idol? And her answer: An idol is what we give our strength to and draw our sense of strength from. When it's gone, we can feel weak, lost, and like nothing. God is about dismantling our idols. This is the part where miracles can happen. Anne Lamott's take, from Help Thanks Wow, is this: "It may be one of those miracles where your heart sinks, because you think it means you have lost. But in surrender you have won." Next, the counselor spoke purposefully to the writer in me. Since you know what tone is, she said, how do you change the tone and the feel of the exercise? The current tone is rigid, controlling spirit behind it, singular focus feeling, non-relational, and have-to. The new tone might be flexible, relational, big picture, fluid in structure, and get-to. I loved the tone talk. It was the most gentle pep rally, yet I could feel it breaking down the resistance. To repeat: Moving forward is #1) changing what exercise means, and #2) changing what exercise looks like. To go from six days of working out per week to five is probably not enough of a change to bring the discomfort level up to where it needs to be. I would still mostly be getting what I want, including an extra bit of sleep on the second gap day. I might even welcome that. So my counselor pushed me a little further and helped me to imagine exercise in new terms. No more of the "how many days per week" scenario. Been there, done that. Reminder to self: I have to change what exercise looks like. That means change the structure, yes, but perhaps also change the mood and tone while exercising. I might trade in Scripture memory work (rigid in its own way) for music or silence sometimes. I might even involve another person occasionally, but let's not get ahead of ourselves. I'm moving now from my six-days-a-week routine to a rolling routine of every other day. It certainly won't be as much movement as I'm used to, but it also won't make me get to that three-day breaking point. The new structure will inform me and remind me often of the truth that I can live some days without exercise. Not counting the first week Lent (we'll just call that a warm-up in preparation for what remains), I'll get approximately twenty days of exercise and twenty days of non-exercise till Easter. Is that twenty good days and twenty bad days? Or forty days of believing that this is how change take place? "I don't think much surprises [Jesus]," says Anne Lamott in Plan B: Further Thoughts on Faith, "this is how we make important changes - barely, poorly, slowly. And still he raises his fist in triumph." It was on that first day of Lent that I made my first move toward freedom. I turned back after a few days and had to seek wisdom of one who has walked this path before me. With her guidance, I regrouped and have taken to the road again. I can feel change coming; challenge and discomfort too. But as Elena Shvartz so profoundly wrote: "If Christ is to visit us, it will be on such pitiful days as these."